Have you seen our first ever edition of the Otto’s Arcade Annual? Distributed late last year with the Townsville Food Magazine, it’s a glossy, colourful, 24 page guide that will help you to understand more about what you will find under the roof of the ever-evolving and always bustling Otto’s Arcade at Warrina. More than just a market, more than just a place to eat, Otto’s Arcade is a complete experience. Natural food is one of life’s true joys and we believe that shopping for it should be too, which is why have created a collective of dedicated lovers of food, each as passionate as the next about their chosen niche… and they are all housed here, at the Otto’s Arcade. We created the Otto’s Annual to keep you up to date with the goings on here at the Arcade. It’s a virtual tour through the marketplace, giving you a fresh peek inside our windows. Each department has its own charm and the workers… well they aren’t just employees, they’re family. 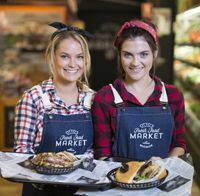 From our Meat Market, to our Artisan Bakehaus, our Gourmet Kitchen, Fish Market, Hen Haus and Parlour Patisserie, authenticity is king at Otto’s. So keep your eye out for the 2018 Otto’s Arcade Annual (available in store and across town at other local Townsville businesses), and join us for a guided tour through the marketplace… you may need to bring a fork. Read the 2018 Otto's Arcade Annual Online here.